More information regarding the MMS error when using Webroot WiFi Security on an Android. 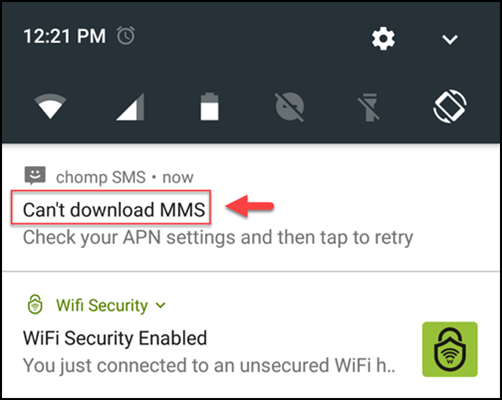 If you are an Android user, you may receive failed MMS notifications while using a VPN. This is not an error with WiFi Security. All Android VPNs may experience this due to a Google design feature. To correct the issue, you will need to go to your messaging settings and change MMS from Legacy to System. Steps will vary depending on the messaging app you use. 1. You will receive an error notification if an MMS message fails. 2. To correct the issue, go to Settings and under Messaging tap MMS.